A new Swedish vehicle has arrived: the Strv S1! This Tier VIII tank destroyer sports the same angular surfaces as its regular counterparts and boasts a similarly powerful gun as well. The Strv S1 will be available in 3 separate packages with varying amounts of accessories included: a no-frills option with just the vehicle and a garage slot to house it, an 'Ultimate' pack that gives you enough boosters and EXP mission tokens to train up your crew quickly and the 'Supreme' pack, which will offer 3 unique emblems inspired by the Strv S1's originating nation. 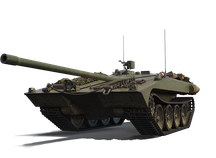 Why should I get the Strv S1? As a high-tiered Swedish tank destroyer, the Strv S1 features an extremely well-angled slab of front armour and a gun that can easily punch through almost every vehicle imaginable. However, there is one question you'll need to ask yourself: Are you comfortable enough with the controls to perform well in battle? With a relatively low mobility score and the unique 'siege' mechanic, It's no secret that Swedish tank destroyers like the Strv S1 are complicated machines to operate and may not be everyone's cup of tea. As long as you're fine with all that, you'll find the Strv S1 a capable steed and a very decent way to train up your crew for future deployments.